Sarcastic filing accessories, at long last! Now I can put off buying that stuffy attaché case I thought I needed. 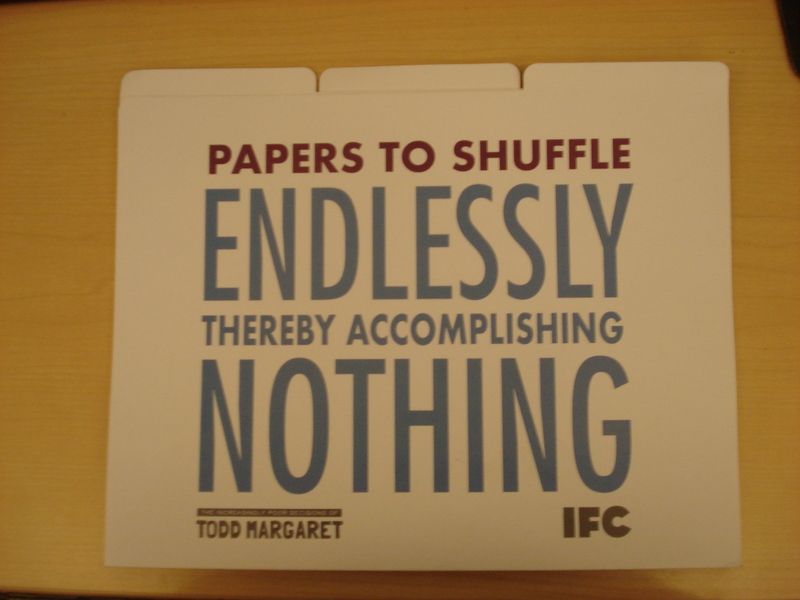 Still, these are good for a laugh — who hasn’t ever thought, “Quick, look busy,” while at work? 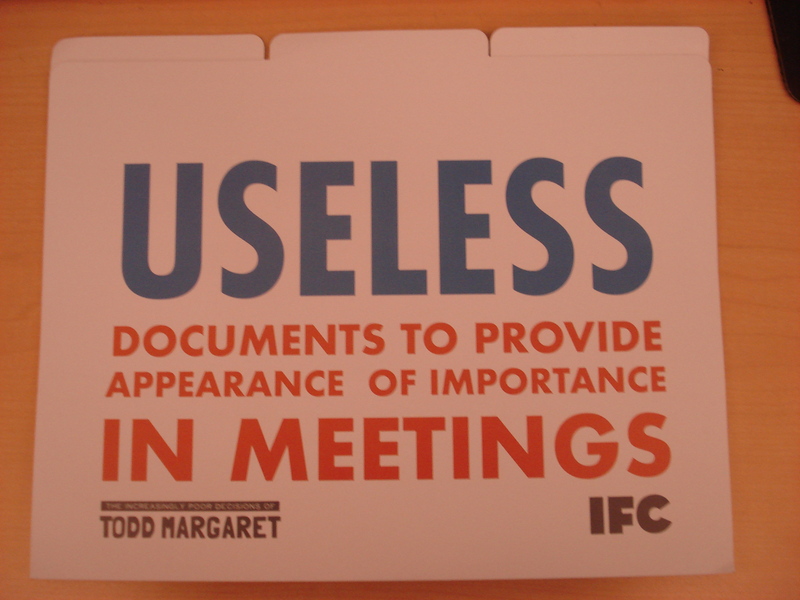 (Except, of course, the ever-industrious yours truly…) IFC’s marketing made more sense once I found out that this comedy was about a horribly-misguided office temp who fakes his way to an executive position. The show debuts on October 1st, with David Cross starring alongside fellow Arrested Development alumnus Will Arnett, a pedigree that sets the bar pretty high for Todd Margaret. That plus the self-effacing office supplies made me skeptical. 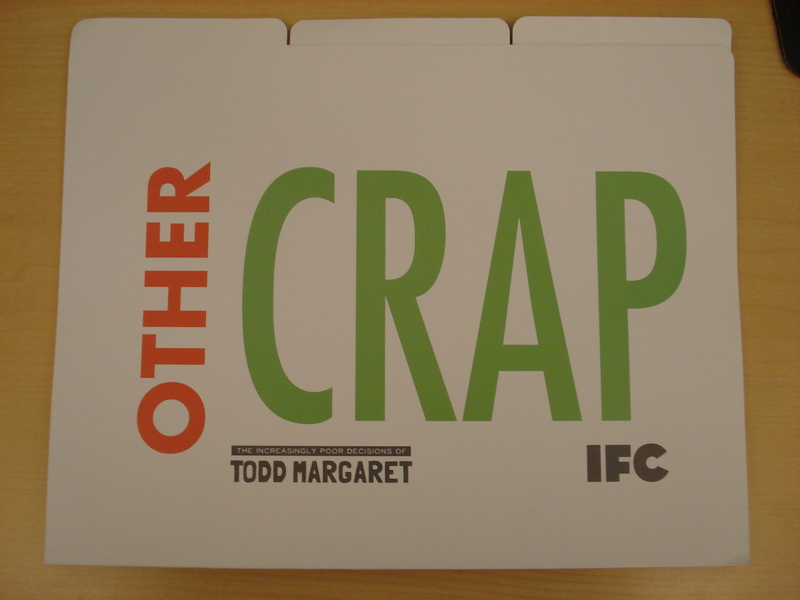 So it was a nice surprise when the teaser episodes IFC sent turned out to be pretty funny. Just goes to show, you can’t judge a book by its swag. If you watched the Academy Awards this Sunday it would have been easy to miss the category for Best Animated Short Film. The presentation for the award was…well…short. But anyone who saw this year’s nominees would agree that none of them lack for quality. Logorama won the Academy Award for its provocative repackaging of trite Hollywood action fare; the film used only recognizable corporate logos to construct the set, characters, and story. And Wallace & Gromit delivered their share of time-tested misadventures in A Matter of Loaf and Death. But I was most impressed by a couple of other imports. Spanish production company Kandor Graphics received a nomination for The Lady and The Reaper. The film is a commentary on how we die and the ways in which life can be distorted as one is pulled back from the precipice of death. At the same time, it’s a frenetic cartoon chase, ala Looney Tunes. Imagine Bugs Bunny examining the medical-industrial complex as he tangles with Elmer Fudd. But for my money, the best entry was one nearly overlooked by the academy: a “commended” Canadian film titled Runaway. In rough, stylized animation, Runaway delivers a political parable set on an out-of-control train. The engineer presiding over this ill-fated ride neglects his duties to cavort with a woman from the first-class car. Soon thereafter, the train accelerates dangerously out of control, inciting a class struggle between the cars in which first-class passengers attempt to buy their safety by bribing, manipulating, and then betraying those in coach. As the film nears its inescapable conclusion, each new development still delivers a surprise. We know what’s going to happen, but still groan and laugh as we struggle to keep up. In nine minutes, that ambiguous combination of ideas manages to surpass anything I’ve seen in a feature film in a long time. In New York, all of the nominees and select commended films are showing at the IFC Center. Oh, recession. What was once a swag deluge is now a trickle. Gone are the fat and happy days of bands promoting albums with faux airplane barf bags. Air travel gear, including a barf bag, to promote The Saturday Knights' album. But there was a hopeful glimmer the swag economy was picking up when this gem arrived last week. A sturdy cotton tote featuring SNL vet Chris Kattan seductively posing in plaid pants. We may not end up watching his new IFC series “Bollywood Hero”, but we are happy the swag gods have delivered once again.